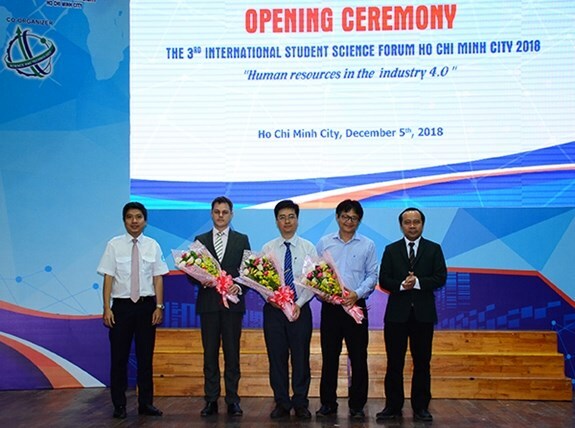 The International Student Science Forum 2018, themed “Human Resources in the Industry 4.0”, took place in HCM City on December 5, attracting 70 delegates from nine countries and territories and over 1,000 Vietnamese students. Speaking at the opening ceremony, Deputy Director of the Vietnam National University (VNU) – Ho Chi Minh City Vu Hai Quan said amid the fourth Industrial Revolution, students need to improve foreign language skills and master scientific study methods as they play an important role in applying modern technologies in study and production, contributing to socio-economic development. Experts delivered presentations about artificial intelligence and its impacts on labour and necessary skills for vocational development. Participating students discussed education and labour trends during global integration, saying that lecturers, schools and organisations will contribute to human resources development in the revolution. Apart from attending plenary and discussion sessions, students will join group activities at the Can Gio Youth Centre for Outdoor Activities and visit Can Gio Mangrove Biosphere Reserve. They will also hold exchanges with fellows from the Banking University of Ho Chi Minh City, the VNU – Ho Chi Minh City’s International University, and visit the Ho Chi Minh City Museum and War Remnants Museum.